Our third stop was the beautiful village of Eidfjord, situated at the end of the Eidfjorden, an inner branch of the large Hardangerfjorden. The village of Eidfjord is a major cruise ship port of call with various tourist sites such as the Sima Power Plant which is built into the mountain itself, the Måbødalen valley, and the Vøringsfossen waterfall. Once again, the view on arrival was stunning. The tour here was a little disappointing – basically amounting to a one-hour bus ride to a little stop that gave home-made apple pie, a look around an old church and the bus trip back! The apple pie was good – but probably not worth a 2 hour round trip. Nice views though…. 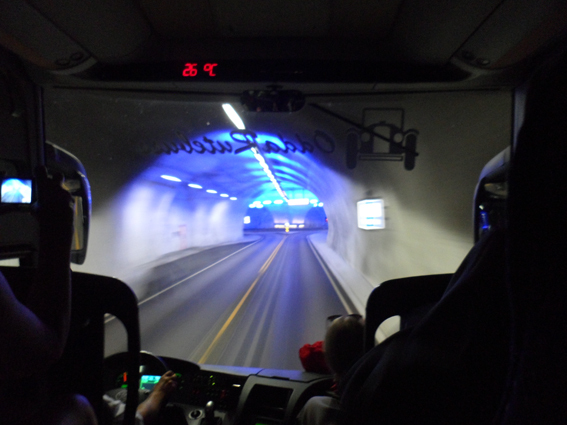 The journey back was interesting, as you can imagine in the fjord areas of Norway, there are lots of road tunnels… but this was the first time I had ever seen a major traffic roundabout inside the tunnel! Once back in Eidfjord, we had a nice walk up into the village, and then back down to the fjord, with some lovely pics of the ship. It was a very quiet and peaceful day, but glorious sunshine once again. So, there you have it, our third day in Norway. Hope you are enjoying these reports and photos. Take care and keep in touch!